Yet another Louder Than War ticket giveaway!! Rebellion is the largest punk festival on the planet and this year boasts an awesome line-up – over 250 bands across six stages, plus the Punk Art Festival, the Literary Stage, and a vast array of merch stalls sourced from across the globe – what’s more its all indoors so the mayhem continues no matter what the UK weather does!! The festival runs from Thursday 6th August to Sunday 9th August 2015 and is held at The Winter Gardens, Blackpool – easily accessed via the UK motorway network, national rail network and serviced by Manchester airport some 35mins away. This years headliners include The Damned, Buzzcocks, The Boomtown Rats, Sham 69, and The Membranes – add to that the likes of Anti-Flag, Less Than Jake, Gang Of Four, Goldblade, The Partisans, Ruts DC, Hugh Cornwell and a whole host of favourites including The Misfits, TV Smith, UK Subs, Paranoid Visions, Dirt Box Disco, Subhumans, The Lurkers and not forgetting a raft of newer bands such as Cretin 77, Evil Blizzard, and Super Fast Girlie Show, an Acoustic Stage featuring the likes of TV Smith, Louise Distras, MDC Unplugged, The Crows and Henry Cluney – to get a full line up head to the Rebellion Bands page. Louder Than War have once again been been appointed as an Official Rebellion Festival Ticket Outlet – we are currently supplying the full range of tickets; from Day Tickets to 4-Day Weekend Tickets available via the LTW Shop. Payment is via PayPal and we happily ship to any worldwide location. However we are delighted to be able to offer up in our latest competition the chance to wins a pair of Full Weekend Tickets with a prize value of £300. 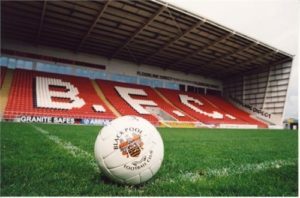 Q. Blackpool is the home of The Rebellion Festival; the town also boasts its own football Club – What is the teams nickname? The Subject line MUST read BLACKPOOL, if it doesn’t your entry will be automatically filtered into the Trash box. Please submit your full name and address, and use a real email as that’s how we will notify the winners. Winners will be notified by email so you need to use a genuine address.